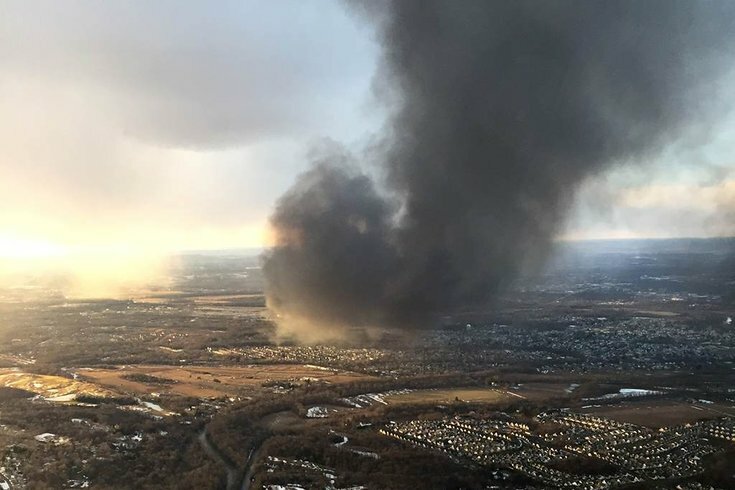 A massive plume of smoke from a five-alarm blaze at a warehouse in Hillsborough, N.J. is visible from miles away. Firefighters in Hillsborough, New Jersey, are responding to a massive 5-alarm blaze that broke out Thursday afternoon at a warehouse near Harold Docherty Memorial Park. According to NJ.com, the fire was reported around 3 p.m. and led to the closure of Route 206 in both directions south of Brooks Boulevard. For several miles in both directions, black smoke could be seen billowing from the scene of the fire. Several witnesses posted photos of the smoke on social media. A spokesperson for the Manville Fire Department said it was believed that the warehouses where the fire broke out had been completely evacuated. Firefighters from Hillsborough, Manville, Raritan Township, Somerville, and Montgomery were among the companies responding to the blaze. According to witnesses, the fire broke out near a facility owned by USA Container Co., Inc. By 6 p.m., the blaze reportedly spread to several nearby warehouses and firefighters were ordered to move back from the scene. Hillsborough Mayor Frank DelCore said that wind was considered a concern to further spread the flames. As a precaution, power was shut off in the area of the fire, police said. Firefighter Dave Mangino posted the following video of the effort underway to put down the flames, suggesting it would be a long night ahead. Hillsborough Township Health Officer Dr. Glenn Belnay said the smoke spreading across the area is believed to be nontoxic. It is not yet clear whether anyone has been injured by the fire.